“I’ve taught you how to live; now I want to teach you how to die. You don’t have to be afraid.” When Becky Baudouin’s mother spoke those words to her, they weren't said lightly. Her mother had an inoperable tumor — and after months of treatment, there was no hope for a longer life. There was, however, assurance of everlasting life. 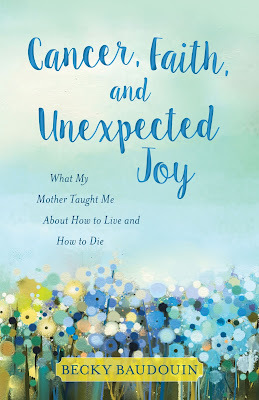 In Cancer, Faith, and Unexpected Joy: What My Mother Taught Me About How to Live and How to Die (Kregel Publications/September 26, 2017/ISBN: 9780825444746/$14.99), Baudouin shares the invaluable wisdom imparted by her mother during her final days. However, Cancer, Faith, and Unexpected Joy, is much more than a memoir. Baudouin equips readers to face death from a Christian perspective by sharing her insights on fear, loss and grief. These honest insights are applicable to everyone's story, not just her own, and can extend real comfort to every reader. Questions for personal reflection or group discussion help both those who are losing a loved one and those who are facing death. Baudouin’s story reveals God is the only source for a spirit's true healing. 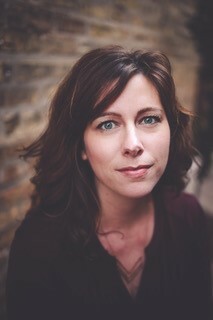 Becky Baudouin (pronounced Beau-dwen) is a freelance writer and speaker and a former columnist for Chicago’s Daily Herald newspaper. Her three daughters supplied her with enough material for a five-year run with her column, “A Mom’s Point of View.” She has written for the marriage ministry at Willow Creek Community Church where she is an active member, and several of her articles have been published in Focus on the Family’s magazine. Baudouin loves speaking just as much as writing and speaks at Chicago-area MOPS (Mothers of Preschoolers) groups and women’s events on topics such as parenting, marriage and faith. She believes in the power of groups and helps lead marriage and grief workshops, walking alongside those in seasons of difficulty and loss. She loves to cook and works part-time as a personal prep chef. Her favorite place to be is around her dining room table, sharing great food and connecting with family and friends. She grew up in northern Michigan and now lives in the Chicago area with her husband, Bernie, and their three daughters. Learn more at www.beckybaudouin.com. She is also active on Facebook (Becky Baudouin), Twitter (@beckybaudouin) and Instagram (beckybaudouin).